I know exactly where I was on the second weekend in July back in 1985 and it was not in JFK Stadium in Philadelphia for Live Aid. I mean, a lot of other 14-year-olds weren’t in attendance either, right? But I actually WAS in the freaking parking lot of JFK on July 13th, 1985 and that’s what makes this all pretty ironic for me. 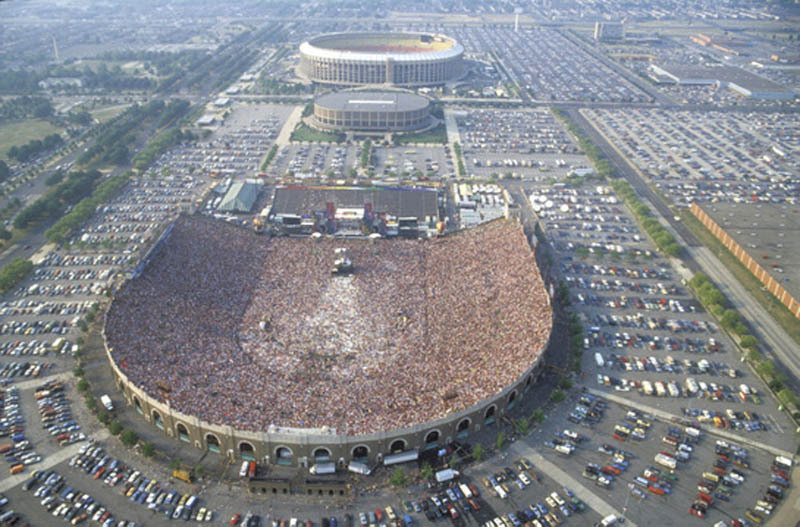 My mom was super religious and her church would have these huge meetups a few times a year and for reasons that never made sense to me, having thousands of people gather in Veteran’s Stadium in the July Philly heat seemed like a good idea to them...so... there we were at Live Aid. Almost. I was just as music-obsessed as a kid as I am now and so the buildup for Live Aid made it a larger than life event for me. Every tidbit in the newspaper I’d cut out. I can remember having my dad bring home Philly newspapers leading up to it so that I could save all of the promo and interviews that they were doing to ensure that 100,000 fans would show up. We were actually in the city from Thursday-Sunday with Live Aid, of course, happening that Saturday. 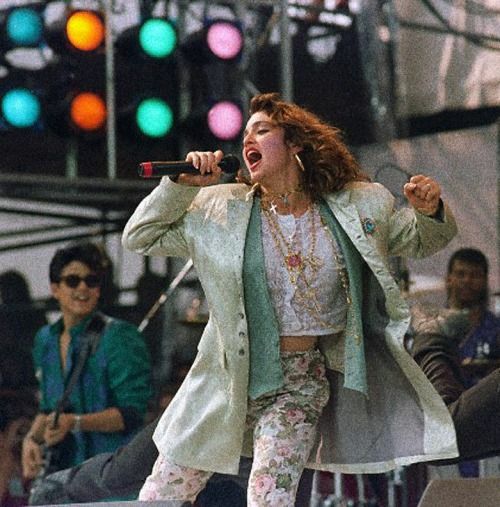 Our hotel near the airport was filled with concert goers and I remember finding excuses to stay in the lobby so that I could eavesdrop on any conversation pertaining to Madonna, Duran Duran and whoever else these complete strangers were excited about seeing. Right before Live Aid I can remember Madonna’s naked photos being sold to Hustler and then of course published. That meant more coverage for her so I smuggled every newspaper article about her scandalous behavior back home with me too. The morning of the event itself I can remember being stuck in traffic literally for hours, which was fine with me. I didn’t want to die for hours in the heat even if it was “God’s will” (or something), I wanted to die in that same heat while wearing a bow in my teased-out hair, lace gloves and a few crop tops layered for coolness. Sitting in traffic was a comfort because I was surrounded by my people, at least until we turned towards the Vet. I sat in my seat hoping that by the time we got out I’d be able to hear something, anything from the parking lot. Philly venues have always been close enough for that to be a reality. Leaving the parking lot probably will forever remain my very favorite traffic jam because dad’s big old Buick Skylark didn’t have a/c and off in the not-to-far distance I could hear Ashford & Simpson’s “Solid” which eventually turned into a set by Kool & the Gang. Who followed them? The material girl herself with extended versions of “Holiday” and “Into the Groove”. Honestly, I don’t think I heard all of that second song by Madonna but I did hear enough to feel like I was part of some sort of musical magic. Live Aid was originally the brainchild of Bob Geldof, the singer of an Irish rock group called The Boomtown Rats. In 1984, Geldof traveled to Ethiopia after hearing reports of a horrific famine that had killed hundreds of thousands of Ethiopians and threatened to kill millions more. 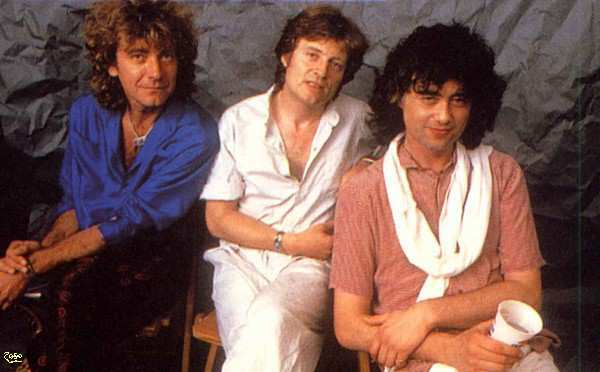 Seeing the devastation prompted Geldof to take immediate action. 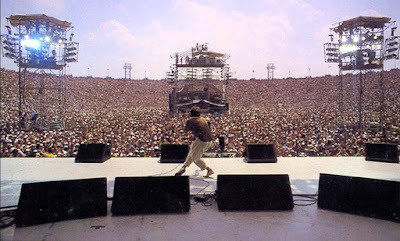 Organized in just 10 weeks, Live Aid was staged on Saturday, July 13, 1985. 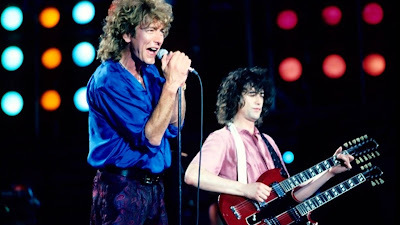 More than 75 acts performed, including Elton John, Madonna, Santana, Run DMC, Sade, Sting, Bryan Adams, The Beach Boys, Mick Jagger, David Bowie, Queen, Duran Duran, U2, the Who, Tom Petty, Neil Young, and Eric Clapton. The majority of these artists performed at either Wembley Stadium in London, where a crowd of 70,000 turned out, or at Philadelphia’s JFK Stadium, where 100,000 watched. Thirteen satellites beamed a live television broadcast of the event to more than one billion viewers in 110 countries. More than 40 of these nations held telethons for African famine relief during the broadcast. The 16-hour “superconcert” was globally a triumph of technology and goodwill, as the event raised more than $125 million in famine relief for Africa.